Containment Protocols: Under no circumstances are any personnel permitted to handle opened instances of RPC-034 without appropriate chemical hazard gear. All unopened instances will be retained within their respective packaging originally discovered in and stored within Warehouse █-██ at Site ██. An on-site protocol will be followed in accordance with "General Site Storage and Containment" procedures for stock and sorting purposes. The packaging of RPC-034 shall be placed upon specialized sensor pallets to detect any possible leakage of highly acidic compounds. If any such breaches occur, the nearest on-site Hazardous Material and Waste Management team will be contacted immediately via remote alarm. Removal of any instances of RPC-034 from their storage room must be recorded in Document U.L-██. 'Opened' instances of 034 will also be recorded when replaced back within the storage area and labeled appropriately. No more than two (2) instances of RPC-034 can be removed at any given time without permission from two (2) Level 3 Security Clearance personnel or higher. RPC-034-2: A red packaging container measuring 20cm in length. 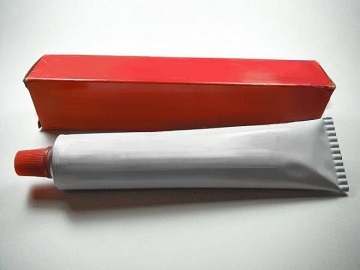 RPC-034-3: A white unmarked 170gm tube with a red cap. RPC-034-4: One basic red toothbrush measuring 15cm in length. The RPC Authority first came into contact with large amounts of RPC-034 in the town of ████████, New York, on April 0█, 19██, after multiple reports of burn-related deaths were received by the local police department (Consult addendum 034-A). Reports of the victims, when discovered, were consistently found within bathrooms or kitchens, with the lower jaw, esophagus, and most of [DATA WITHHELD] entirely burned or dissolved away, as well as various holes dissolved into the floor and surrounding furniture both beneath and around the victim. Of particular note, were the leftover teeth of said victims after presumably using RPC-034 to clean them. These teeth were entirely sterile and crisply whitened with no visible signs of corrosion. A total of ██ delivery crates of RPC-034 were found on board a ███████ brand delivery truck en-route to various supermarkets across the state. When questioned by undercover RPC units posing as local police, the driver reported having no knowledge of the hazardous product he was delivering. All contents of the delivery were confiscated, and the driver given Class A amnestics. RPC units followed up with an interview of the local distributor staff, reporting no knowledge of any unmarked toothpaste. An investigation into how the company acquired such items is currently underway, including a statewide search for anymore similar burn reports as well as a mass confiscation of any previously delivered product, reported having been sold at a 'discount'. Responder: Hello, ████████ Police, what is the nature of your emergency? Responder: Ma'am I need you to calm down and speak more clearly, what's wrong with your husband? Hello? Ma'am? All reported incidents involving RPC-034 had been followed through by RPC units, the victims questioned about their acquisition of 034 and given Class A amnestics. 1. Requests for use of 'empty' variations of these objects for chemical experimentation elsewhere must be processed through the on-site manager and storage director. 2. Cross testing with other RPC's is currently pending Board approval.